I heard the most amazing story yesterday, and I want to share it with you, both as inspiration and as an illustration of the kind of healing I believe is taking place in these astrologically potent times. An older couple, I’d say in their late 50s, married many years ago and after four years of marriage and one child, got a divorce. They both went their separate ways. She stayed in the Pacific Northwest, while he traveled the world, made a fortune, married again, and bought a palatial home in an idyllic tropical location. But they remained on friendly terms and stayed in touch over the years. Last year, his wife got cancer, and he spent many months caring for her and watching her die. He was devastated, and his life felt meaningless. Old illnesses began to plague him. His ex-wife, who was dating another man, nevertheless helped him through at every step of the way. Earlier this year, her family was getting together for a reunion. He happened to be in the area, transporting his wife’s belongings to their children. He stopped by, and the flame reignited. As it so happened, her boyfriend had been killed in an accident, and she was now single and available again. They are more in love than ever. Their eyes went from sparkling for each other to wet with tears as they recounted all the seemingly bizarre coincidences that brought them back together. She is going to move to his home, where he is planning to build a studio for her to explore her artistic talent. Their wedding will be at a secret, sacred spot. With his health much improved, he is going to retire and work on creative projects as well. I suspect they also will be taking long walks hand-in-hand on the beach, watching the sun set. What amazed me all the more was that this man, while not a corporate type, was a what-you-see-is-what-you get type. He obviously has some psychic powers and was aware of them at an early age, but his career was in traditional fields for men. I believe we are going to hear more and more stories like this in the next few years. With Jupiter, Chiron, and Neptune in conjunction, deep healing of old wounds is taking place, and this includes rifts between men and women. I’ve written often that the separation between the divine feminine and divine masculine is one of the most critical wounds that beings on the earth plane have suffered, and healing it will have widespread implications for all of us. Other aspects are producing a synergistic effect, including the mutual reception between Uranus and Neptune and the opposition between Saturn and Uranus. If any of you have stories to tell about deep healing, I’d love to hear them. Unfortunately, I can’t share my own very private story in these pages, but I can tell you that it is big, and it goes to my very core. 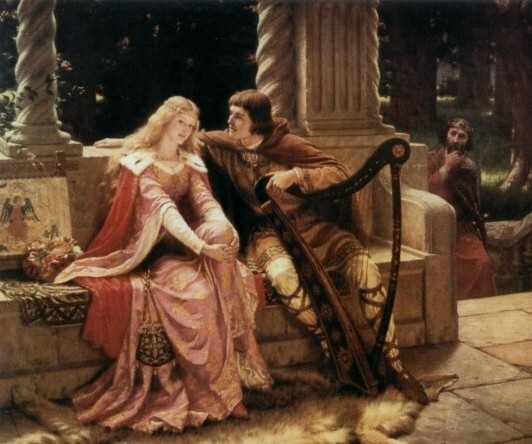 Image: Tristan and Isolde, by Edmond Blair Leighton, 1902. The source of this tragic love story is very old, and the tale holds clues about the ancient wound that separated the divine feminine and masculine. This entry was posted in About astrology, Forecasts, Love & Relationships, Saturday Extra! and tagged Chiron, Jupiter-Neptune conjunction on July 26, 2009 by Pat. A few months ago my third grade boyfriend and I began corresponding on Facebook. We’d seen each other a few years ago at our 30th high school reunion (which was the first time we’d seen each other since high school graduation) and each of us felt an attraction, but I chose to pretend that I did not notice the strong energy between us. Well, long story short, we did see each other while I was visiting our hometown earlier this summer, and we have embarked upon a long distance romance. When I read the bog post above, I had to share!